A Rear Transition Module (RTM) helps bring I/O signals off the backplane. Direct plugging from RTMs offer a higher resistance to shock and vibration compared to a ribbon cable connection style. RTMs facilitate high-speed and general-purpose I/O transfers between WILDSTAR™ OpenVPX motherboards and other components. 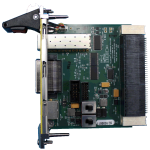 These Wild40 3U EcoSystem Rear Transition Modules are compatible with WILDSTAR 7 OpenVPX mainboards.